There are wonderful home remedies to get rid of dandruff permanently, naturally and quickly. If you are suffering from dandruff, please don’t worry, even I suffered from dandruff when I was young and I got it rid of it quickly with home remedies. The most common symptoms of dandruff are appearance of excessive amount of white flakes in the scalp and extreme itchiness. For me, it was mild itchiness and flakiness and once I started using home remedies, it stopped very quickly. Dandruff can be caused due to variety of reasons. It can be due to stress, poor diet, fungal infection, not washing hair often and even certain medications can cause dandruff. You can read about all the causes for dandruff and the chemical treatments available along with their side effects here. There are really wonderful traditional home remedies and herbs to treat dandruff. 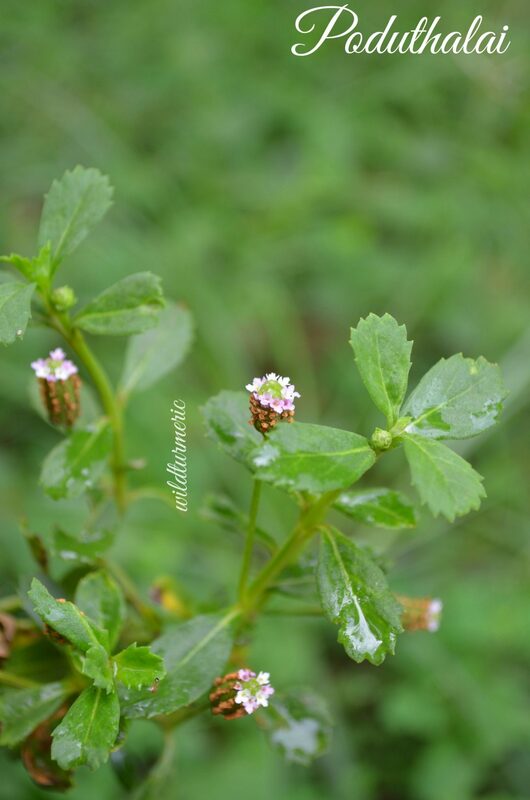 Here in Tamil Nadu, there is a herb called Poduthalai (we call dandruff “பொடுகு” in Tamil) which treats dandruff really well. 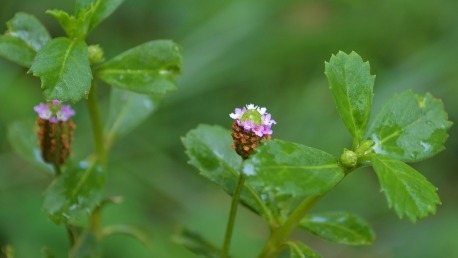 The treatment my mom used for me was fenugreek hair mask, fenugreek hair mask works really well in treating dandruff and it is a traditional remedy that has been used here in Tamil Nadu for many years. But it does not agree with everyone as it is very cooling. 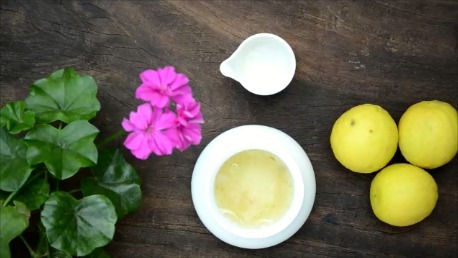 Lemon is also an another traditional and easy home remedy that has been used for a very long time. It treats dandruff well. Along with treating dandruff, it also treats other scalp infections like itchiness. 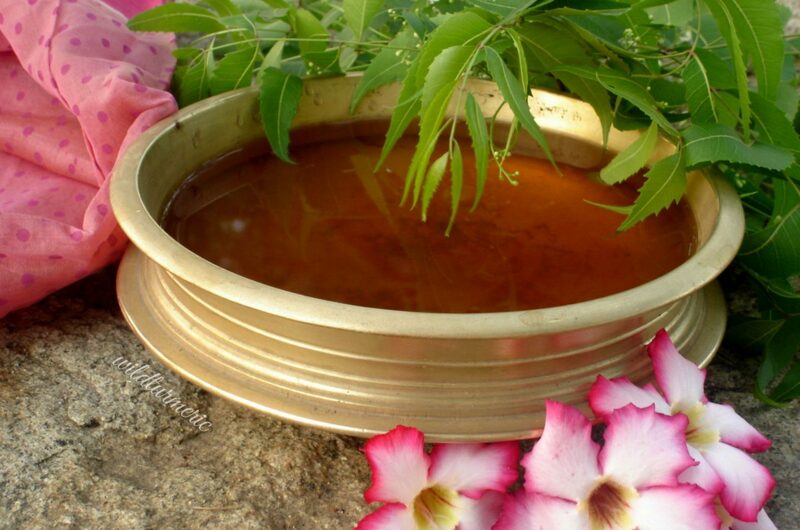 Neem water is another home remedy for treating dandruff. 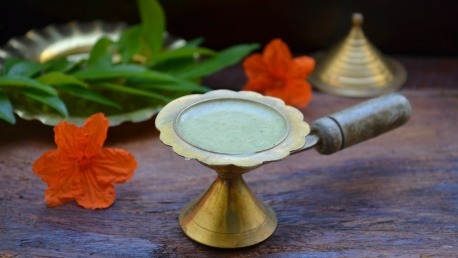 Neem in any form will treat dandruff well, I make neem leaf hair rinse at home regularly. How To Use These Remedies? Choose one remedy given below and follow it at least weekly thrice at first to treat dandruff. Once the dandruff is gone, continue doing the treatment weekly once to prevent getting dandruff back permanently. 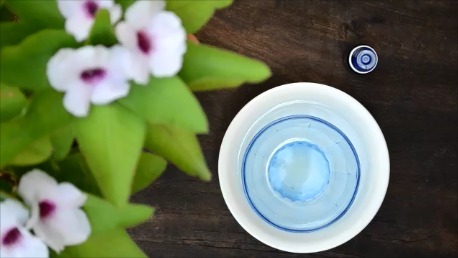 Take a tbsp of fresh aloe vera gel in a bowl. Now add in the juice of half a lemon to it and use it as a hair pack. Both aloe vera and lemon have anti fungal and anti bacterial properties that helps treat dandruff really fast. If you don’t have fresh aloe vera, you can use store bought gel but I would suggest using fresh aloe vera gel for best results. Take a tbsp of fenugreek powder in a bowl. Add enough curd to make a runny batter. Now let it sit aside for 30 minutes, This will help the fenugreek gel. Now beat it well with a spoon and apply as a hair pack. This hair pack is not for people with sinus infection. Both fenugreek and yogurt especially sour yogurt when applied as a mask treats all scalp infections including dandruff very very effectively. 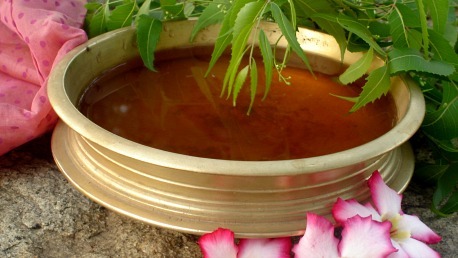 To make the neem hair rinse, boil a bunch of neem leaves in water till the color of the water changes. 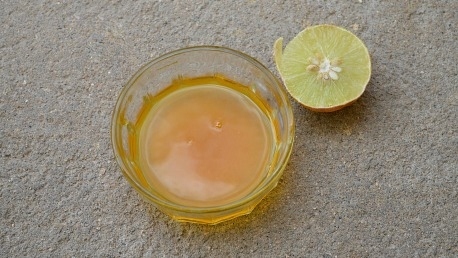 Strain, let cool completely and add in the juice of half a lemon and use it as a final hair rinse. This hair rinse is a very effective treatment for dandruff. This rinse will also give a nice shine to hair if you use it as a final hair rinse. It is my favorite hair rinse that I use often. 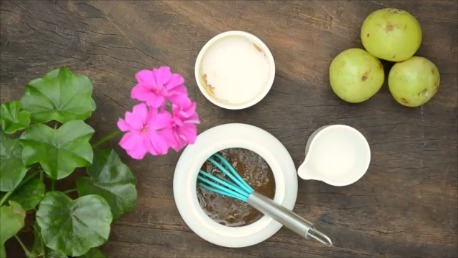 Take a tbsp of amla powder in a bowl. Add in enough fresh aloe vera gel got by grinding the fresh aloe vera gel found in the middle of aloe vera leaf in a mixer. Mix to form a paste and use it as a hair pack. Wait for 20 minutes before washing it off with a mild shampoo. This hair pack not only treats dandruff, it promotes hair growth as well. Mix equal quantities of lemon juice and apple cider vinegar in a bowl. Take a tbsp of this mixture and add a cup of water to it and use it as a hair rinse. This rinse is amazing for treating dandruff. After using the hair rinse, just wash it off with water not shampoo, though not a traditional remedy it works really well. Take a tbsp of coconut oil in a bowl. Now add in equal quantities of lemon juice to it. Mix well and apply it all over the scalp with a piece of cotton. Wait for 15 minutes before washing it off. This is an amazing home remedy for dandruff. I used this home remedy for my son who got dandruff when he went to hostel and surprisingly it stops the itching the first time you use and with subsequent use, you will find dandruff completely gone. 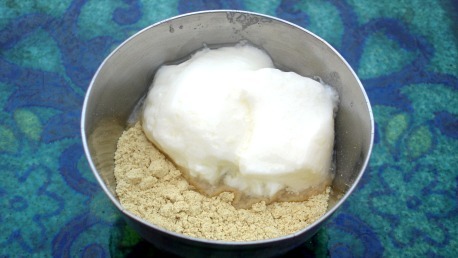 For the hair pack, take required amount of poduthalai powder in a bowl, add in enough rice water and 1/4 tsp of coconut oil to it and apply as a hair pack. Wait for 30 minutes before having hair wash. This hair pack also treats dandruff very effectively. You can read about poduthalai in detail here. Egg hair masks are great for treating dandruff. For making egg hair pack, break open an egg in a bowl. Now add a tsp of unrefined coconut oil to it and mix well. Apply this hair pack using a brush, wait for 15 minutes and then wash it off. Egg hair packs don’t smell once you wash it off with a shampoo but the bathroom smells for a day, cleaning the bathroom is the only thing I don’t like about egg hair packs…. Tea tree oil is amazing for treating dandruff as it has effective anti fungal and anti bacterial properties. To use tea tree oil for treating dandruff, mix 3 drops of tea tree oil with 1 tbsp of unrefined coconut oil in a bowl and apply on the scalp. You can also warm the oil by placing the bowl in hot water before using. Wait for 15 minutes before washing it off. Try to do this treatment weekly twice for best results. Curry leaf oil hair pack is surprisingly effective for treating dandruff. To make curry leaf hair pack, take a handful of curry leaves and grind it to a smooth paste along with homemade yogurt and little bit of lemon juice. Use it regularly as a hair pack at least weekly thrice to see results. Next Post 5 Top Anti Dandruff Shampoos You Should Try For Indian Hair !